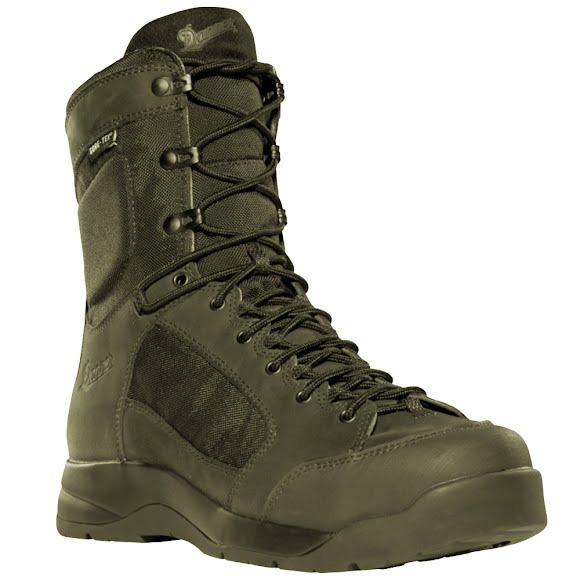 Danner has your vertical assault footwear needs covered with the DFA (Danner Flight Assault). Featuring low oil content nubuc leather, a lightweight 1000 Denier nylon upper, a hexagonal low lug outsole with a patent pending Vertical Insertion Arrestor (VIA) technology insert which provides abrasion resistance and superior control in fast roping applications. 100% waterproof and breathable GORE-TEX liner is engineered to keep your feet dry and comfortable - even in extreme conditions. Durable, low oil Nubuc leather designed for the demands of fast roping combined with rugged 1000 Denier nylon upper for lightweight comfort and mobility. Cement down construction offers excellent durability in a light weight package. Variable lacing system locks the heel into the pocket providing a glove-like fit and superior control. Polyurethane footbeds are padded for comfort and arch support. Co-molded midsole plate for springboard toe return, impact absorption and puncture resistance. Patent pending Danner Descender outsole featuring a Vibram V-4 ultra-abrasion rubber compound built into the medial side arch for fast roping control. Multidirectional lug pattern for quick acceleration and braking in all directions.